Check out the funky Jeep Renegade! What tow car ability does this quirky four-wheel-drive have and can it give you what you need on your caravan holidays? This is a bit different, isn't it? Think of Jeep, and you think of big, tough 4x4s. The Renegade offers more of the same but in a smaller size. And there are two-wheel-drive versions for SUV looks with lower running costs. We’re testing the 2.0-litre diesel automatic with four-wheel drive. Limited-spec cars are comprehensively equipped, but toys come at a price: £28,295 is a lot for a car of this size and power. So, what tow car ability does the Jeep Renegade have? Is it good enough to justify its high price? It’s not the biggest or heaviest 4x4 you can buy for similar money. Are the Jeep’s off-road ability, rugged image and long list of standard kit enough to compensate? The Renegade is a difficult car to pigeonhole. On one hand its price is close to that of the Kia Sportage and Nissan Qashqai. But size-wise it sits between these and smaller crossovers such as the Peugeot 2008 and the Renault Captur. The Škoda Yeti has similar dimensions to the Jeep but costs less. The kerbweight of 1548kg gives an 85% match figure of 1316kg – well within the legal towing limit of 1500kg. However, the noseweight limit is just 60kg; careful caravan loading will be necessary to ensure that’s not exceeded. Compare that with the Kia Sportage’s 100kg limit and the Mazda CX-5’s 88kg maximum. The 2.0-litre engine has 140PS (equal to 138bhp) and 258lb ft of torque. That maximum figure looks modest, but it’s torque that is more important when towing. The Jeep’s engine is strong enough to pull a Swift Expression 586 with a Mass in Running Order of 1325kg – we recorded a 30-60mph time of 14.4 seconds. The nine-speed (yes, nine!) automatic gearbox swaps gears efficiently to make the most of the engine’s muscle. Crank up the stereo, though, because the diesel engine is noisy if working hard. Once up to the legal limit, the Jeep is stable and composed for a high-sided car with a short wheelbase. It’s not impervious to crosswinds, but any unexpected movements on a breezy day are slight and easily controlled. The Renegade handled the lane-change test well, too. There was a lot of lean when pushing hard and we could hear squeals of protest from the caravan’s tyres, but the Jeep stayed firmly on course. We were less impressed by the Jeep’s brakes, which felt wooden and needed a firm push to slow car and van effectively. In an emergency stop from 30mph the Renegade took 11 metres to halt on a dry track. That’s reasonable, but we’ve tested cars in similar conditions that needed a metre less. The hill start was a weakness when we tested a manual-gearbox Renegade at the Tow Car Awards, but the auto version reviewed here proved much more able. The electronic parking brake held the outfit still and released smoothly when the driver applied the throttle. The Jeep pulled to the top of the 1-in-10 slope with no wheelspin or sign of strain. No doubt the Jeep’s four-wheel-drive system helped, and would have made a bigger difference in wet conditions. 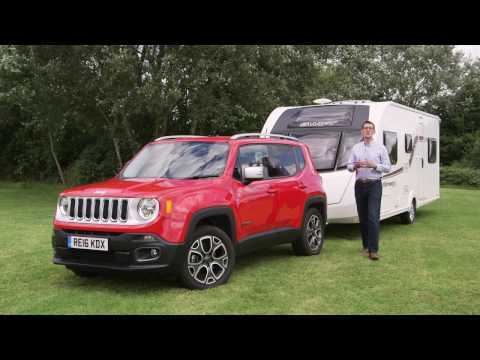 Unlike most of its 4x4 rivals, the Jeep Renegade can be switched to lower-ratio gearing for serious off-roading, or towing away from an especially boggy campsite. That’s a definite plus if you stay at out-of-the-way sites in all weathers. However, the Jeep’s low noseweight limit is a frustration, and you can buy heavier and more powerful 4x4s for similar money. Jeep has designed the Renegade to be seriously capable off-road, with its low-ratio ’box and a choice of modes for the four-wheel-drive system. To some extent its off-road prowess compromises the Tarmac driving experience. The ride is a little jiggly at low speeds, and lacks the firm control of a Mazda CX-5 when driven with enthusiasm. It’s not uncomfortable, but doesn’t have the poise of its best rivals. The steering is rather numb, but it’s light enough for easy parking. Other controls are surprisingly heavy, with an accelerator that needs a firmer-than-expected push and a stiff gearlever. These are more characteristics than flaws, and you soon adjust in a few miles. Without a caravan’s weight to pull, performance is lively, but the engine could be more refined. It clatters at low revs and sounds strained under acceleration. Other sources of noise aren’t intrusive, though, so once cruising at an even pace the cabin is reasonably quiet. Around town the Renegade’s smaller size is a plus, and it will comfortably slot into parking spaces that would be a squeeze in a Hyundai Tucson or a Nissan Qashqai. Rear visibility isn’t great, though, so it’s just as well there are rear parking sensors. It’s a capable enough car in everyday driving, without ever really excelling – unless you take it off-road. There is where the Jeep Renegade’s in-between size makes it hard to judge. Viewed as an upmarket alternative to small crossovers, it’s reasonably practical. However, compared with similarly priced SUVs, the Jeep is short on space for passengers and luggage. Design-wise, though, it makes a welcome change from the market’s many generic crossovers. There are lots of neat touches, such as the small outline of a Jeep making its way up the windscreen pillar, and the classic shape of the grille and headlights repeated on the seats and around the stereo speakers. At first glance the cabin seems reasonably well made from solid instead of plush plastics, but a persistent rattle annoyed us during our time with the car. Thinner pillars front and rear would be welcome. Otherwise, the Renegade's high driving position gives a clear view out. There’s enough adjustment to the seat and the steering wheel to keep most drivers happy, and the broad seat means larger drivers won’t feel hemmed in. That said, some may wish for more support when cornering. In the back, the Renegade’s short length impinges on passenger space. Legroom is very cramped. Six-foot passengers will find their knees pressed into the front seat if the driver is equally tall. We were disappointed that there are no air vents for rear-seat passengers between the two front seats or in the door pillars to keep everyone at a comfortable temperature. At least the transmission tunnel is only slight, giving room for everyone’s feet if there are three in the back. Boot space is modest at 351 litres, which lags behind the Škoda Yeti’s 416 litres. It’s not even close to the Kia Sportage’s 503 litres. There’s no load lip, which makes it easy to lift and slide heavy items into the boot. There are also useful features such as load-lashing hooks, a 12V socket and a built-in torch. But these don’t compensate for a boot that will struggle to cope with a family’s luggage on caravan holidays. Fold the rear seats down (they split 60/40) and there’s 1297 litres to fill, with a slight slope to the floor. That’s considerably less than the seats-down capacity of most rivals. The Jeep Renegade range starts from £17,495 for a petrol, or £19,195 for a diesel. If you want a high-spec car with four-wheel drive, though, the Jeep is quite expensive. Sitting just below the top of the range, our Limited Auto 4WD costs £28,295. That’s £750 more than the most expensive Škoda Yeti, and not far off the price of some larger, more practical crossovers. Resale values are modest, too. What Car?’s experts predict that the Jeep will be worth just 39% of its original price after three years and 36,000 miles. That’s not offset by any saving at the fuel pumps: the official combined figure of 48.7mpg isn’t great. Still, while towing we achieved a decent 28.8mpg. What goes some way to justifying the price is the Limited model’s spec. Leather upholstery, 18-inch alloys, dual-zone climate control, heated front seats, Bluetooth connectivity, a DAB radio, sat-nav, cruise control and electric windows are just some of the items on a long list. Safety kit includes forward-collision and lane-departure warning systems as well as trailer sway control. In conclusion, you get a lot of equipment for your money, but not a lot of car. The Jeep Renegade is an easy car to like, but it’s also easy to find fault with. It’s distinctive and different, but not the most practical tow car or particularly good value. As a tow car, it performs well without being exceptional. Stability at speed is good and the Renegade handles an emergency lane-change well. It’s not a quick tow car, but the 2.0-litre engine has enough pulling power to handle a sensibly matched caravan. What’s more, if you like to stay on farm campsites, the Jeep’s sophisticated 4x4 system is a strong argument in its favour. However, we do have some reservations about the 60kg noseweight limit. It’s unusually low and will be very easy to exceed if you don’t check the noseweight carefully. As an everyday drive, the Renegade is competent, but it doesn’t match the refinement of, say, a Nissan Qashqai or the entertainment of a Mazda CX-5. It’s a solid performer, but there are so many capable crossovers that it’s hard to see what the Renegade does that its rivals don’t – at least on the road. Off-road, of course, it’s a different story. Our biggest reservation is that the Jeep isn’t as roomy or practical as most rivals. Rear legroom is tight, and boot space at a premium. You can buy similar cars for much less, or rivals with more room at a similar cost. You can reduce the £28k asking price if you haggle, but it’s still a lot to pay for a relatively small car, even one as characterful as the Renegade.